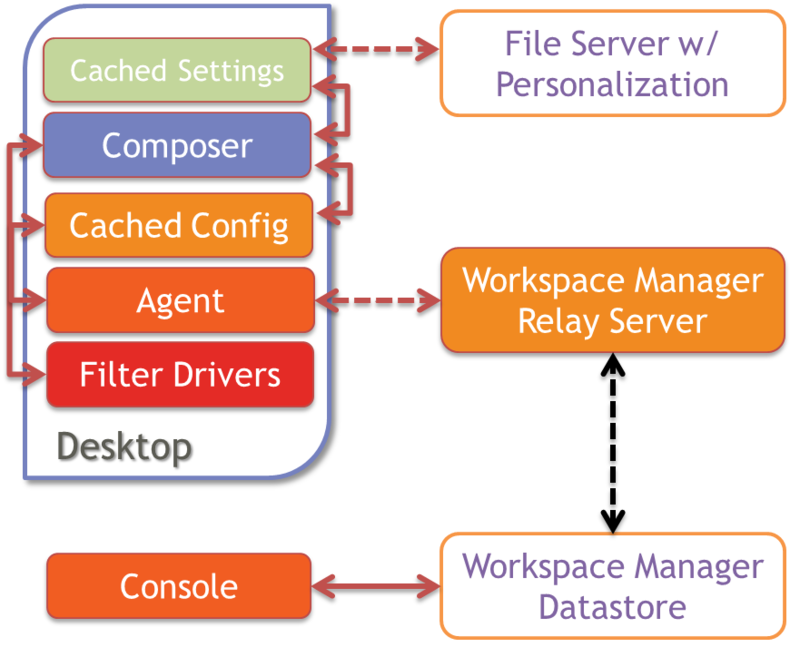 With the release of RES Workspace Manager 2012 a new component was introduced: the Relay Server. In this article I’ll explain what the Relay Server is, how it can help you in your Workspace Manager (WM) environment and reveal some of its mysteries. 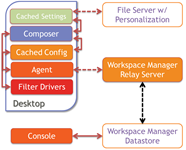 The Relay Server was introduced with RES Workspace Manager 2012 as an optional component. The Relay Server is an intermediate component between the RES WM Agent and the Workspace Manager Datastore, if required Agents can still connect directly to a Datastore. It is a Windows Service that can be installed on a Windows operating system and by default listens on TCP port 1942 (registered at IANA), the same port that’s used by the RES WM Agent (see other facts). While the name suggest the Relay Server relays the traffic between a RES WM Agent and the RES WM DataStore it actually doesn’t, instead it acts as intermediate storage. The Relay Server polls for changes every x time (default 5 seconds)and updates its local cache after x time (default: immediately). The Relay Server stores the entire RES Workspace Manger Datastore in its cache location: %ProgramData%\RES\Relay Server, this location can be changed. Since this location is on the system drive (by default) it will monitor the available free disk space to prevent resource depletion (see other facts). RES Workspace Manager stores all the configuration, logging and usage tracking data in a RES Workspace Manager Datastore. 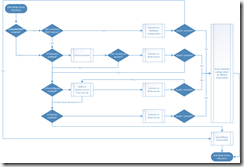 This makes the Datastorea critical component in a RES Workspace Manager infrastructure. When administering RES Workspace Manager the Console always communicates directly with the Datastore, never via a Relay Server. By default Agents connect directly to the Datastore. 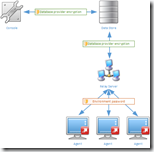 This requires that the Agents are able to communicate to the Datastore, even when they are in different locations. This could led to challenging situations because either the Datastore needs be replicated to multiple sites or each Agent communicates via a WAN connection to a remote Datastore. In a large environment the server hosting the Datastore could reach its connection limit. 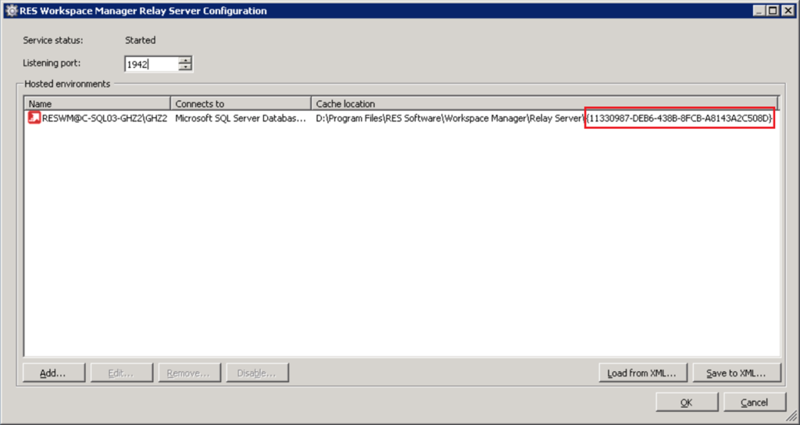 With each Agent having two connections (one for the configuration database and one for the logging database) a Microsoft SQL server could reach its User Connection limit of 32.767 (see Maximum Capacity Specification for SQL Server). When the Datastore is stored on an Oracle server this limit is “100s of thousands”. 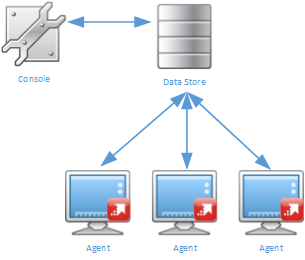 When Agents are configured to communicate with the Relay Server the number of connections to the Datastore is decreased to two per Relay Server, regardless of the number of Agents. This (of course) does not mean less license are needed, each agent still requires a license. To prevent each Agent from communicating with the Datastore (or Relay Server) via a WAN connection a Relay Server can be placed in each remote site. With a Relay Server in a remote site only the Relay Server communicates over the WAN link, all agents can communicate via the LAN with the Relay Server. 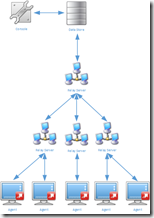 The configuration of multiple Relay Servers is straightforward, simple even. Especially when compare to configuring database clusters and it’s cheaper too. 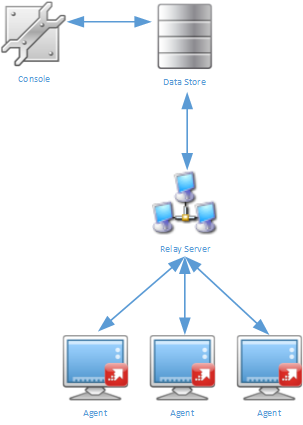 Relay Servers can retrieve the content of the Datastore also from a sibling Relay Server, it doesn’t have to communicate directly with the Datastore. This makes the Relay Server architecture very flexible and scalable. Separation of agents based on their location: Depending on their physical location agents could contact the nearest Relay Server. Martin Lako explained how this can be achieved using Workspace containers in this article. Prevent database cluster: High availability and resiliency is achieved by using multiple Relay Servers which are easier to setup and do not require an expensive license. 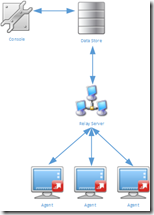 Improve availability of the Datastore in a non-persistent environment: As explained here. No need for native database drivers on Agents: Since the communication with the Datastore is handled by the Relay Server this is the only machine that requires special drivers. Improved security: Credentials used to communicate with the Datastore are not required on the Agent or during installation, instead an environment password is provided which does not grant access to a database server. 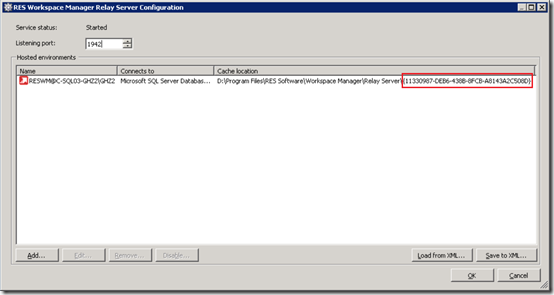 Less connections to your RES Workspace Manager Datastore: For instance to overcome the user connection limit of 32.767, see Maximum Capacity Specification for SQL Server. 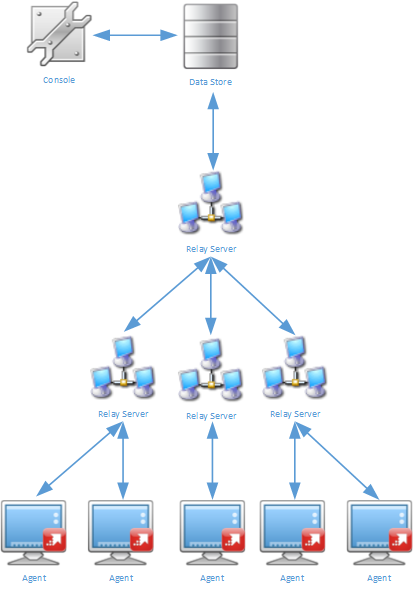 Minimize traffic for remote sites: Only the Relay Server communicates via the WAN instead of each Agent individually. Simplify Windows authentication for SQL: Instead of granting all users / computers access to the RES Workspace Manager Datastore only the Relay Server needs access to the Datastore, simplifying the agent and database configuration (as suggested by Iain Brighton in the comments). If you have another use case that’s missing in this list, let me know in the comments. When the Relay Server communicates directly with the Datastore: The database client (or native database drivers) for the used database type. It is recommended to provide the Relay Server with a static IP address. However DHCP can be used since DNS will provide name resolution. The data that’s transmitted between the Agents and the Datastore via the Relay Server contain configuration data that is potentially confidential. Some of the configuration data could contain credentials and usage tracking could contain data that should not be exposed. Altered configuration data could potentially redirect users to a compromised environment. When the risk of compromising configuration / usage tracking data is too high or a risk exists that configuration data is altered, data should be secured. By default traffic between Agents and a Relay Server is encrypted with SSL using an environment password. Optionally traffic with the Datastore can be secured with database provider encryption. The Agents communicate with the Relay Server every x time (default: 5 seconds) and polls if there are changes made in the Datastore. When updated settings are available, of when the Agent has updated usage Tracking data, the Relay Server and Agent will exchange XML files. This traffic is encrypted with SSL using an environment password. The environment password is a string value that needs to be provided via the RES Workspace Manager Console in the Administration\Relay Severs section. This value needs to be provided before the Relay Server is configured. Important: The environment password is not stored in plaintext but hashed( and then encrypted) for discovery via DHCP. The encrypted+hashed environment password always changes, even when the same password is chosen. Even though a different string is returned the agent is able to decode the same encryption password. 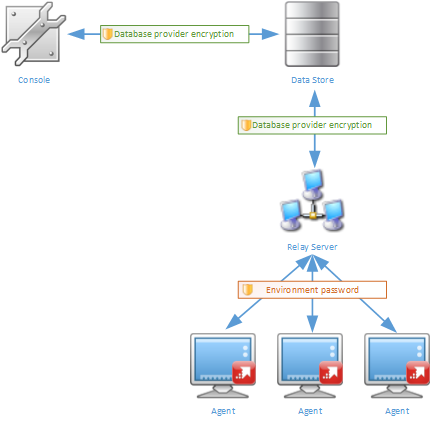 The RES Workspace Manager Datastore can be configured to use protocol encryption when connecting to Microsoft SQL (DBPROTOCOLENCRYPTION=yes)., When protocol encryption is enabled the communication between the Datastore and the Relay Server will be protected. The Microsoft SQL Native Client needs to be available on the Relay Server but not on the Agents (as they communicate with the Relay Server using a different protocol). Microsoft is trying to get the SQL Login deprecated and force Windows authentication. Besides that Microsoft strives to get rid of SQL login the Windows authentication is more secure since it relies on tickets instead of username/passwords. Dave Bryant did an excellent job describing how to set up RES Workspace Manger 2012 with MS SQL Windows Authentication. The installation of a Relay Server is very straightforward (next > next > finish) so I won’t bore you with that. 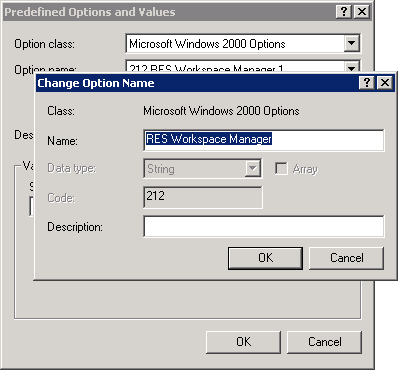 What’s important is that all prerequisites are met and the RES Workspace Manager Datastore is configured. Depending on your processor (and OS) architecture you can choose the associated installation. The unattended installation be executed by providing a configuration file or using public properties specifying the Datastore or the parent Relay Server. Important: The configuration file needs to be stored on a local drive, a network drive is not supported. What is a bit odd is that at the next page public properties are listed to provide the details of the Datastore or a parent Relay Server. Nonetheless, they are ignored. The only way of installing the Relay Server unattended is using the configuration file. I’ve asked RES Software to elaborate on the public properties. Once I receive an answer I will update this section. Update June 10th 2014: The public properties will be removed from the documentation. If you don’t want (or can’t) use a SQL login you can configure the Relay Server use Windows Authentication. Dave Bryant wrote an article at the RES Software Blog explaining the steps involved. You can read the article here. Using a service account to use Windows Authentication is optional. As an alternative you can keep the service running with the Local System Account (the default setting) and grant the computer account (the machine running the Relay Server) the required permissions on the database. After the Relay Server is installed and configured the RES Workspace Manager Agents needs to be configured to contact the Relay Server instead of a Datastore. The location of the Relay Server in an Agent is configured with a “discovery”. In the RES Workspace Manager Console in the Administration > Agents section the settings of the Agent can be configured. One of the configuration settings is Datastore connection. This value is either Connect to Datatore or Connect through Relay Server. 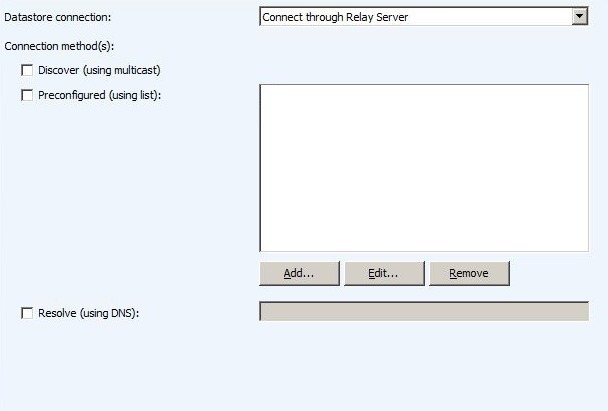 When the Connect through Relay Server is configured the following connection method(s) are selectable. 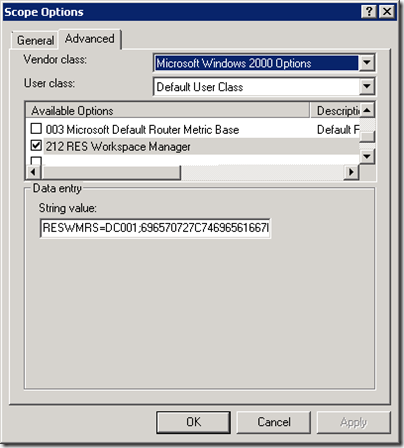 There is a fourth discovery method: DHCP (available since RES Workspace Manager 2012 SR3). 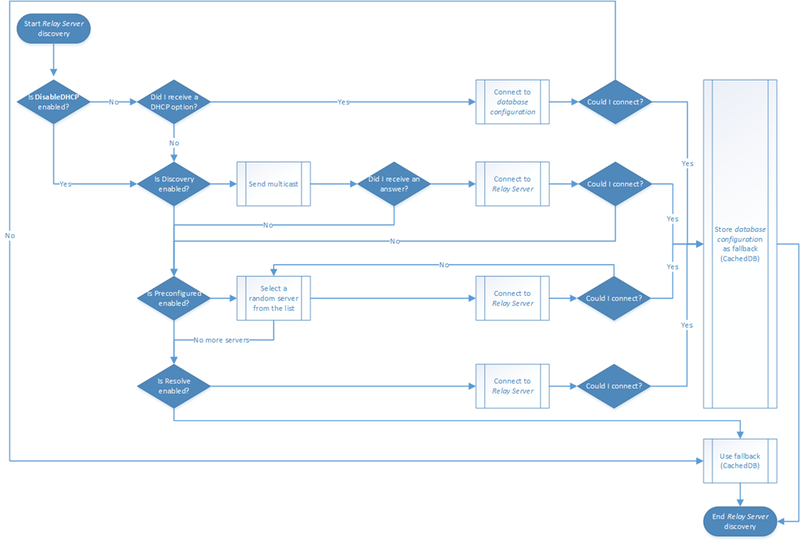 The discovery methods are executed in the same order as they are displayed. The selected discovery methods are tried until a successful connection is made. What’s good to know is that once an Agent receives a Relay Server configuration – where it successfully can communicate with – it stores it in its local registry (as CachedDB) as a fallback. If the Agent receives a new datastore configuration via DHCP it will stop processing the list of other discovery methods. If the Agent cannot connect with the Datastore provided via DHCP it will revert back to the fallback (CachedDB). This means that if an Agent receives a faulty configuration via DHCP it will not try another discovery method. Effectively this means that all other discovery methods are skipped if a datastore configuration is received via DHCP. Keep this in mind if you want to use other discovery methods as a fallback. A customer has two datacenters with in each datacenter thousands of hosted private / shared desktops runningRES Workspace Manager. To avoid all Agents flooding the WAN connection contacting a Datastore multiple Relay Servers are placed in each datacenter (which contacts the Datastore). While the Relay Servers are available in each datacenter, the Agents have no idea which one it should contact if a list is provided (it chooses a random Relay Server from the list). So a DHCP discovery method is used to provide the Agents with the Relay Servers from the same datacenter (this implicates that each datacenter has it’s own DHCP scope).The general though was that if the Relay Servers in the first datacenter are unavailable the Agents are allowed to contact the Relay Serversin the second datacenter, as a fallback. So as a second discovery method the list is provided containing all Relay Servers. Unfortunately (as described above) the list is never queried if a Datastore configuration is received, regardless if it can contact the Datastore. This will create a file called WMRSConn.txt containing a text similar like below. This is the Datastore configuration string value used in the DHCP option. You need to replace relay1.example.com:2012 and relay2 with the address of the Relay Servers your Agents need to contact. Log on to the DHCP server and open the DHCP snap-in. 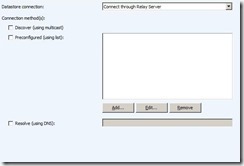 Select the DHCP server in the list and click Action > Set Predefined Options. At Data type , select String. Keep in mind that a vendor specific option is not the same as a DHCP option. If you add a regular DHCP option with ID 212 ~ 219 it will be ignored by the Agent. Learn more about (Microsoft) Vendor specific DHCP options and how to configure it on a non-Microsoft DHCP server here. Troubleshooting the Datastore configuration via DHCP can be cumbersome. There are tools available that can be help you (like Wireshark). To simplify the troubleshooting I wrote a PowerShell script that shows all DHCP options received by the client. Learn more about reading DHCP options and download the PowerShell script here. 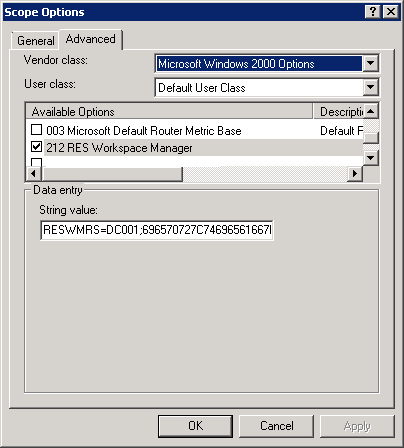 Optionally the RES Workspace Manager Agent can be configured to ignore DHCP information by setting the following registry key to “True”,”yes” or “1”. PS: DHCP actually provides a Datastore configuration which can contain a direct Datastore connection or a Relay Server configuration. What’s very nice about this discovery method is that it requires no configuration (except when routing prohibits multicast) and high availability is very easy, only active Relay Servers will respond which prevents the Agent from contacting a broken Relay Server. When the Agent is configured to discover Relay Servers it will multicast via UDP on address 224.1.1.60:1942. Just like the Agent and Relay Server port 1942 (registered at IANA by Bob Janssen) is used, this can’t be changed. During a UDP multicast the Agent client will use source port 1942 and destination port 1942. A Relay Server will answer using a dynamic source port and destination port 1942. I’ve been informed that the address 224.1.1.60 can be changed without notice, that’s why it isn’t documented (yet). Once the Agent receives a list of Relay Servers it will pick a random server from the list and try to connect. If that connection fails it will try another server until the list is exhausted. The last discovery methods that’s used by RES Workspace Manager Agents is resolving a Relay Server using DNS. An agent will try to contact a specific Relay Server directly. This can be a Relay Server that’s used by other Relay Servers or a fallback server that normally shouldn’t be contacted. 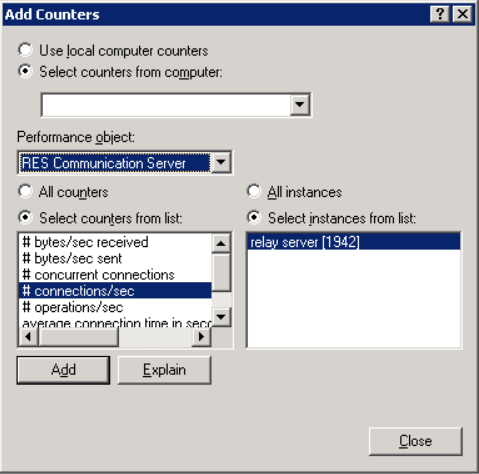 Sizing a Relay Server is difficult as it highly depends on the RES Workspace Manager environment. Each environment has a different number of configuration items, amount (and type) of changes and usage tracking. Of course the interval at which agents polls for changes has a big impact on the sizing of a Relay Server. The tests were performed on a Dell PowerEdge 2950 with 2 Intel Xeon 3 GHz processors and 4 GB of memory running Microsoft Windows Server 2008 R2. When sizing your environment it’s important to monitor the performance metrics. You can use the Windows Performance Monitor to monitor your Relay Server performance. In the Windows Performance Monitor the Performance object – for example RES Communication Server– can be selected, it will display the performance counters and the instances available. Since you can run multiple Relay Servers on a single server multiple servers can be monitored as separate instances. A single Relay Server can connect to different environments, each environment is identified using a unique identifier (GUID). This GUID Is also visible in the path of the cache location. 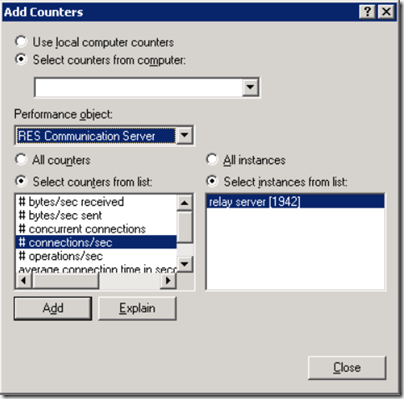 For more information about performance counters see the RES Workspace Manager 2012 Administration Guide. TCP port 1942 is also used by RES Workspace Manager Agent. As a result you can’t run both on the same machine without changing the port number. This could be applicable if the same machine is used to publish Citrix applications. 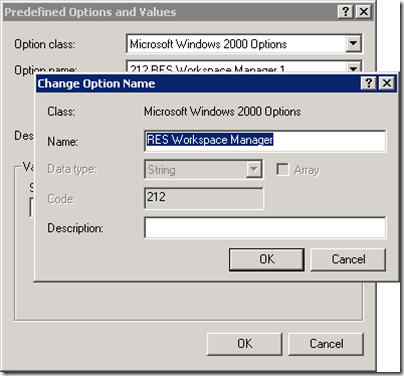 RES Workspace Manager 2012 SR2/SR3 Agents cannot be installed unattended when User Account Control (UAC) is enabled (a fix is available here). This is solved in SR4. NOTE: The trace file will grow continuously, enabling trace file for a longer period is not recommended. Hi Ingmar – an excellent whopping article! Just to expand on the use cases; we mandate Relay Servers when Windows Authentication is required on the SQL server(s). This mitigates the need to manage the service properties on every WM agent. The WM agents’ services can be left running under Local System account and we only need to manage the service properties/password changes on the Relay Servers. your article really helped me out with configuring Dynamic Relay Server through DHCP! Didn’t know you had to pick a number in the range 212 – 219 for the DHCP Scope ID, that solved it for me.